I love sitting still, doing less, and finding ways to just be (more with less). I’ve been practicing this for years, and sometimes I forget that slowing down takes work and practice. We will continue that practice together moving forward, but I’ve recently recognized that sometimes doing is essential and occasionally, busyness can be a well deserved distraction. Especially when you are really sad. I get down like everyone else, but it’s rare that I am really sad. I don’t need much to be happy, and expressing gratitude for what does makes me happy usually has me feeling joyful. This week is a little different. My daughter is leaving today for Australia. For a year. I’m so happy for her, and excited for her big adventure, but I am already missing her. I will be visiting and I know we will be in touch often, but I love having her close by and the time we spend together. I’ve been preparing for this, but still feel sad. Did I mention she might be gone for a year? Guinness, our 8-year-old pup has an aggressive form of bone cancer. Last Thursday, I took him to the vet for what I thought was a pulled muscle or tendon, and got the really bad news. Our family is working through this shocking news, trying to keep his pain managed, and thoughtfully considering the treatment options. None of them are easy, or have a very good outcome, but that said, there is nothing I won’t do for this dog. He came into our lives within weeks after I was diagnosed with MS in 2006 and helped to heal our family. Now it’s our turn to heal him back. Because I feel like crying most of the time, I’ve shifted my focus from feeling to doing. I recognize my sadness, but don’t want to feel that sad, so I’m keeping busy. If you are really sad, I hope this to do list will help until you feel better. 1. Write: I may not be sharing my feelings with all-day tears, but I am expressing them with ink on paper. I won’t share or keep everything I write about, but it helps to get it out. If you write or enjoy another creative process, use it to help you relax and process. 2. Help: I’ve been running errands and helping my daughter pack and prepare for her trip. She is starting a blog to share her adventures, so I love helping her with that too. Think about others when you are feeling down. Lifting others will lift your spirits too. 3. Clean: Get lost in sweeping or washing dishes. Even laundry can be soothing with the right attitude. I have a feeling that my home will be really clean by the end of the week. 4. Take action: I know I don’t control the outcome of any of this, but implementing a plan and taking action can prevent a downward spiral. The sooner you go from victim to advocate or champion, the better. 5. Move: Working out and taking walks can boost a low point. Many studies show that people who exercise regularly benefit with a positive boost in mood and reduced stress levels. 6. Take care: It’s natural to want to pour all your time and energy into trying to fix everything, even if that means sacrificing self-care. I almost went in this direction until I remembered that in order to give my best, I have to be my best. Eat well and get plenty of sleep. 7. Ask for help. Tell people what you need. Talking to my close friends and family this week has been a huge help. It’s just nice to know they are there. Accept help and advice, and then trust yourself to know what’s best. If you’re sadness is lasting longer than you think it should, or if you think your sadness is leaning toward depression, ask for professional help. If you want to help me, please don’t be sad for me. Instead, send your love, prayers, wishes and good thoughts to Guinness. Love has powerful healing properties. None of these things will take away your sadness, but they will help you get through it. I’ve been using all of these strategies over the past few days and they are helping. In my experience, one of the benefits of simplifying your life is more happiness, or time to enjoy more happiness, but it doesn’t prevent sad things from happening. Maybe being really sad helps us fully appreciate the real sweetness of life. Don’t judge yourself for crying or feeling down. Take time to be sad, and then get back to the sweetness. I’ll feel better soon, and if you are really sad, I hope that one of these suggestions helps you feel better too. Lots of thoughts with you! 🙂 Best wishes for everything to work out for the best. It’s great to see how you can turn your sadness into advice to others. I’m so sorry for this suffering that has come into your life and your dog’s life. I will indeed be sending love and prayers. I recognize the wisdom and logic of have an action plan to keep from falling into a pit of sadness. I might choose that option sometimes if the emotion feels too overwhelming. Another option is to simply allow the emotion and to be present with it or to be present with the feeling that you don’t want to be too sad. When I have done this with sadness, I came to see that the emotion is impermanent and changes and that gives me more peace and freedom. It might feel wracking at first, but it does shift on its own. Leaning into the sadness instead of away from it also helps to break my heart open to all the sadness in the world, so I know that I am not alone and my sadness is put into a bigger perspective. These are great action steps. Of course, it doesn’t help to get stuck in sadness. We need to keep moving and I think these are helpful ideas for doing that too. You’ll do what is best for your dear dog. I only found you yesterday and I’m so glad I did, your blog is wonderful. One of the things that will help you get through this difficult time is your open attitude to recognising the upset you feel and addressing it, through things like writing this blog post.Already you’re helping yourself deal with it better than if you tried to soldier on or fell apart. I have a dog, Georgie, who brings me such joy and whom I love more than I ever knew possible! I think we can learn a lot from our dogs, they live in the moment, they don’t dwell on the past or worry about the future but just take life as it is right now. Guinness won’t be worrying about how he feels tomorrow, he’s just dealing with what’s happening right now and I think that’s a good example to follow. Your strategies are great, I would add getting out into nature to the list too. Somehow being around plants, trees, wildlife, whether it’s in a garden, park or the countryside, soothes the soul and helps you to feel a little more peaceful. I’m so sorry that you are going through this! It is a devastating loss, and so hard to face when there is no way to fix things for your loved pet. It’s good to see you are taking such a positive approach. Sending my good thoughts to all of you. Those are a few hard trials to go through. It’s hard when your child leaves, I know. Sounds like exciting times for her and wonderful that she will be sharing through her blog. So sorry about your dog. Dogs are family members for sure. I pray that your dog will have none or minimal pain in his days he still has with you and blessings for you and your family. So sorry to hear about your dog. That’s painful. I’m sending positive vibes your way that he will get through this with flying colors. And I know it’s sad that your daughter is leaving for a year, but you can’t help but feel totally excited for her and this new adventure. She’s going to have such an amazing time. I busy myself and clean clean clean when I’m angry and sad. But talking to someone professionally (maybe not in this case) can really help you just lay it all there without judgments. This especially helps if you are like me and bottle things up or do not want to show people how you are really feeling. It helped me going through divorce. I was clear for the first time ever. We lost our beloved lab many years ago to bone cancer. He brought us joy beyond measure, and we miss him still. Prayers for healing to Guinness and your family. You are an inspiration to us all, and for that I thank you. Now it is our turn to help you up during this difficult time. I hope your sadness fades soon, and you can return to the sweetness. sorry for the news Courtney… these are tough times… but they too shall pass… I know it doesn’t really help to hear it but I am still saying it! Will be sending lots of positive vibes… and on the good side you’ll spend more time with you daughter before she lives than you would have otherwise…. you’ll take a few extra walks…. and have a cleaner then ever house!!! Sending love and healing thoughts & prayers for Guinness. I totally understand the pain of having a sick dog, and the agony of losing one. Been there more than once. Our animals add so much joy & love to our lives, but since they don’t live as long as humans we are always opening our hearts to sorrow when we love them. And it’s absolutely worth it. I hope you & Guinness will have some quality time together! I also understand the sadness of having your daughter so far away, even though you are happy for her adventure. I’d feel the same about that too. Keeping our kids close is what we love! I try to stay busy when I’m sad~ I clean, declutter cabinets, visit friends, walk with my dog, do gardening & try to stay productive until I feel better. Sending light & love your way to help you on this journey of change in your life. So sorry to hear about your dog and your daughter leaving. I always get so much out of your posts. Sending good thoughts your way! Sending lots of love to Guinness. 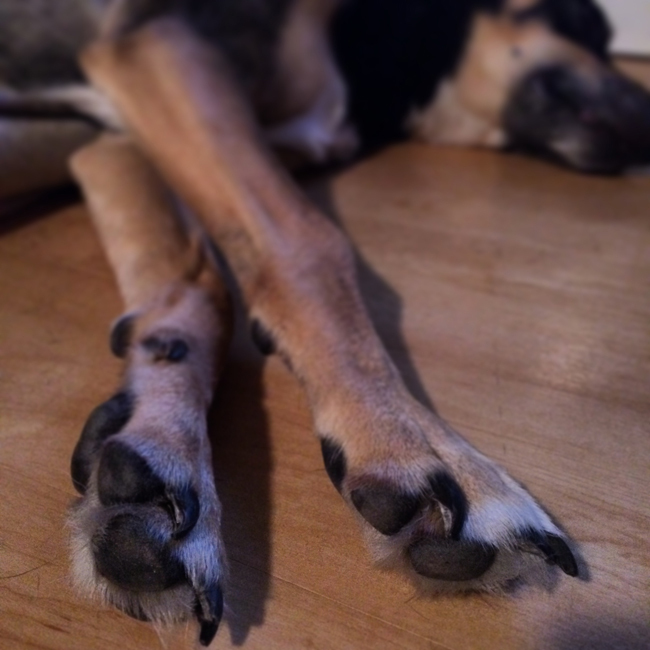 (I love dog paw photos!) We went through bone cancer with one of our dogs a couple of years ago. I took a little comfort in knowing that we could really make the most of the time we had left and not find out too late that we should have thrown the ball one more time or stopped for an extra belly rub before rushing out the door. My friend’s dog had the same diagnosis earlier this year and she made him a bucket list (eat a steak, go to the beach, etc) and had a great time making sure he lived his life to the fullest. She shared their adventures with her facebook friends. This reminds me that I’ve been far too busy lately and neglecting to spend enough time with my own beloved dogs. If you have any questions and want to hear from someone who has been there, feel free to reach out. Sending love and strength your way too. Oh gosh, so sorry to hear about your Guinness. Make his days as comfy & familiar as ever & enjoy his company as he enjoys y’alls. Don’t give up hope for your dog. I have a 10 yr old Rescue dog from the pound that I love with all my heart. He has had 2 cancer surgeries & last year he blew his left back leg ACL out & we had to have surgery for that also. The Vet cut right through his bone. He’s still with me! There are amazing Vets out there that can help! How you manage to write so eloquently in the midst of such sadness is a gift. Thank you for sharing this with your readers, so that each of us can find ways to experience sadness and when it’s necessary, keep moving forward. Sometimes you just have to be sad, cry some and then remember that sooner or later the sun will shine again. My heart goes out to you and your family. I know how hard it is when our fur babies are sick. Thank you for sharing this post. I just lost my mom in February and I was feeling quite bummed over the weekend with this being the first Mothers’ Day without her. I will definitely try some of your suggestions. I’m so sorry to hear about Guinness. It is a hard time and keeping busy is a good (albeit temporary) solution. Enjoy the time you have with him. Sending best wishes your way. So sorry to hear this. I am in Australia, where is your daughter heading first?. Thinking of you at this time. I have never read a helpful list quite like this before. Thankyou for sharing your sadness, but an extra big thankyou in advance for how helpful this will be to use when I am sad next time. Thank you. I’m so sorry about Guinness. I think everyone who has ever loved and lost a pet knows that hole that finds it’s way deep in your heart. It’s been 3years since we lost our sweet Jackson and I still can’t see a yellow lab without thinking of him. Animals are something special and when they are ill it can take it’s toll on us humans. Unfortunately, I don’t have any words that will probably make a difference except to say I’m thinking of you and your family. Sending love and healing thoughts your way, Courtney. I’m sorry to hear about your dog’s diagnosis; sending you (and Guinness) lots of warm thoughts. Thank you for your honesty. I’m so, so sorry about Guinness. When my cat Sputnik was diagnosed with a bladder tumor, they basically told me it was all over but the shouting. They gave him only a few weeks, but his indomitable little spirit persevered and he lived for over a year. I know how hard it is, but there’s also something very special about being able to care for a beloved pet in their twilight hours, so treasure this time that you have together. And my advice is not to be afraid to let yourself feel the sadness too. So very sorry to hear about Guinness Courtney. I am sending love, and healing thoughts his and your way. Sending my love and hugs to Guinness and to you too. Take care. I am so sorry. That is so hard. I will be thinking of you, your dog and your daughter. Love to you. Oh, no! I’m so sorry to hear about your pup. I’m sending positive thoughts your way. I find that cleaning is a productive and therapeutic thing to do when I’m feeling out of sorts. Letting go is never easy. Whether it is for a good reason (your daughter growing up and becoming her own person with so many opportunities ahead) or for a sad reason (your beloved pet dog becoming ill) change in our lives takes a little time getting used to. Somehow, we always cope and learn something from the experience. You are a strong person (I have learned so much from your blog) and will get through this as you have gotten through so much before. My best wishes to you. I really needed this post today. Thank you. You are a truly gifted blogger and wordsmith. I am really sorry to hear about your sad news. Your pup must mean the world to you and this is the same kind of grief as knowing any human is suffering. Your sadness is understandable for your daughter – but she will have a wonderful time in Australia! If she needs a friendly local to show her around Sydney, please email me – I’d be happy to give her a little tour. Courtney, you are in my thoughts. Thank you for sharing with us. I so enjoy your writing and wish you comfort. My heart goes out to your and your family, this is a lot of change all at once. We want to hold on to those dear to us and life makes it harder it seems especially as we get older. I have a special furry friend and he has been down the last week. He is 16 and we have had 14 of those years with each other. This list came along at the time I really needed it. My many thanks! Hugs and loving light sent your way my dear. ENJOY EVERYDAY you have together with Guinness! Showing him how much you love him & keeping him comfortable is the most important thing you can do for both of you. Sending much love & prayers from Florida. All of my thoughts are with you and Guinness and your family. I know how terrible it is to watch your wonderful dog get sick. My family’s dog who I grew up with passed away a few years ago and I still think of her often. Now I have my own dog, and I have not known any more stressful time than when we’ve got to visit the emergency vet. I’m so glad to see you are doing your best to stay positive and productive. When my dad was dying from cancer, I threw myself into #2. I ran all the errands and helped out wherever I could so that my mom wouldn’t have to and could stay with him, and so that I could keep my head. In the end though, I think every sadness presents a chance to grow and learn and become a stronger, more resilient person. And I am always awed by the flood of positivity and support from others during such a time. It is so hard to let our children grow up and leave us, but I can’t imagine how hard it must be to see her go so very far away. My heart goes out to you. I think keeping busy is a good thing to do, otherwise your mind will go to all sorts of bad places in the world of “what if” – what if she gets sick, what if she is lonely, etc. It’s hard to be a mom, that’s for sure. I will be praying for God to give you sufficient strength and courage for this tough time. So sorry, too, about your dog. So sorry to hear about your doggy, SO SORRY! Only the best to Guinness and you and your family. Sending all the positive energy your way. It’s hard to always be the one that leads, that holds everyone’s world together and has all the wisdom, especially when times are tough. My thoughts are with you, and prayers and whatever else can help you, Courtney. Just sent a prayer up above for Guinness. I have a 2 year old white boxer that I love with all my heart and soul (no children, yet) and my heart goes out to you and your family. Stay positive!! Hope your daughter has a great time in Australia! Thank you for sharing your sadness today. I waved my son off to Australia today and it has hit me very hard. I will follow your well timed advise and finish my de cluttering and clean the house too. 1. Guinness is an awesome name. 2. Dogs are the best! 3. Australia rocks (most of the time) so your daughter should have a great time. 4. When l’m sad or stressed l clean. 5. All the best wishes to you, Quality of time together will give you lasting memories in the future. Sending good vibes from here, Courtney! I’m so sorry you’re sad. When I feel really down, I clean the house. I often have to force myself to get started, but as I’m cleaning and when it’s done, it lifts my spirits. I think it’s a way of imposing order on chaos, LOL. We’re with you, Courtney! I really know how sad it is to think about loosing your beloved dog. I have lost too many dogs in my life but the loss of my last dog, Taxi, was the hardest. I found out he had a tumor in his heart and two days later I had to end his life because he finally showed me how difficult it was for him. He was a big beautiful loving shaggy dog. I had him for four years after his previous owner died and he filled my world. I feel so blessed to have been with him for that time but loosing him was one of the biggest losses of my life. I am so sorry to hear about your dog’s diagnosis. I am a small animal veterinarian and always hate to tell owner’s when we suspect their beloved pet may have osteosarcoma. They really do quite well after amputation- best of luck with whatever treatment plan you decide- happy to help in any way if I can… I have thoroughly be joyed your website- thanks! So sorry to hear about your dog….wishing you and your family the best. -> for Guinness, a miracle in the form of healing. I wish you nothing but the very best & thank you for remaining generous even in the midst of all that is happening in your life. I am so sorry about Guinness. I just found you and your blog, and you are such a ray of sunshine. Here’s hoping that you find peace in whatever path is ahead. Know this: Guinness will be OK with whatever happens, as our dogs always are. They are so tough, even in suffering. It’s US, their wimpy people, who despair in such sadness on their behalf. It’s just a sign showing how much you love your dog. Very sad for you with you dog. I lost my dog in January, miss her something awful. She had lived a very full life. I hope this does not sound mean or hurtful, but having been through cancer in my kitty a few years ago, please remember that often the best thing is to let them go instead of putting them through the grueling treatments for cancer. It is so hard when our children’s adventures are a bittersweet reminder that they are supposed to live their own lives, separate in so many ways from ours. I feel for you.